Harry Potter World Part 2: Hogwarts Here we Come! 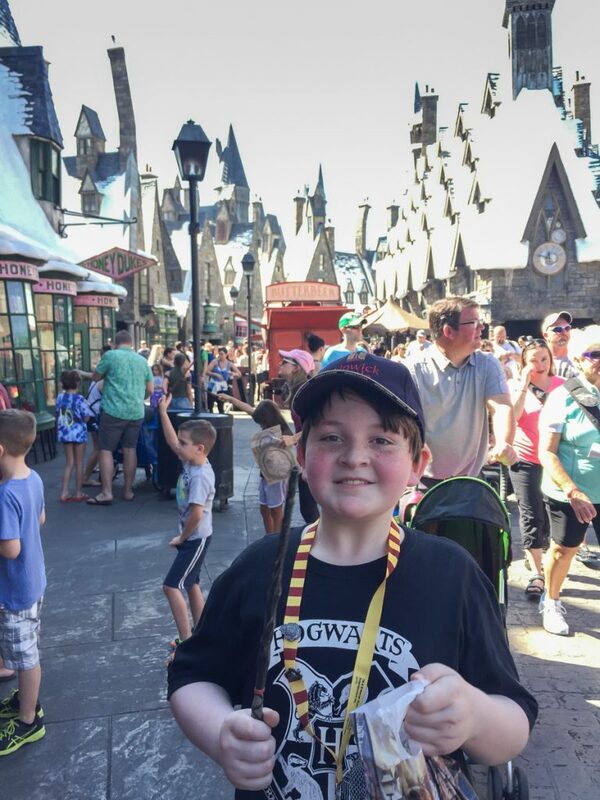 Yesterday I told you all about our very special first visit to Universal Studio’s Harry Potter World where we got a private audience with Olivander the Wandmaker and explored every inch of Diagon Alley. 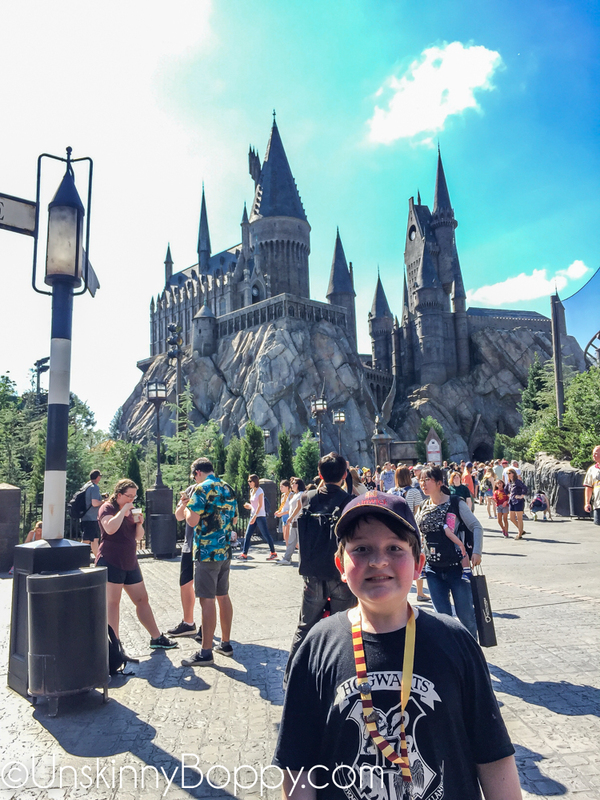 The next day we went to Islands of Adventure to visit Hogsmeade village and see Hogwarts castle. Unfortunately Universal was SUPER crowded on this day, which meant he had to stand in line just to wave his wand and cast spells on the storefronts. It was totally packed, so I recommend trying to visit during a time when it’s a little less crowded. 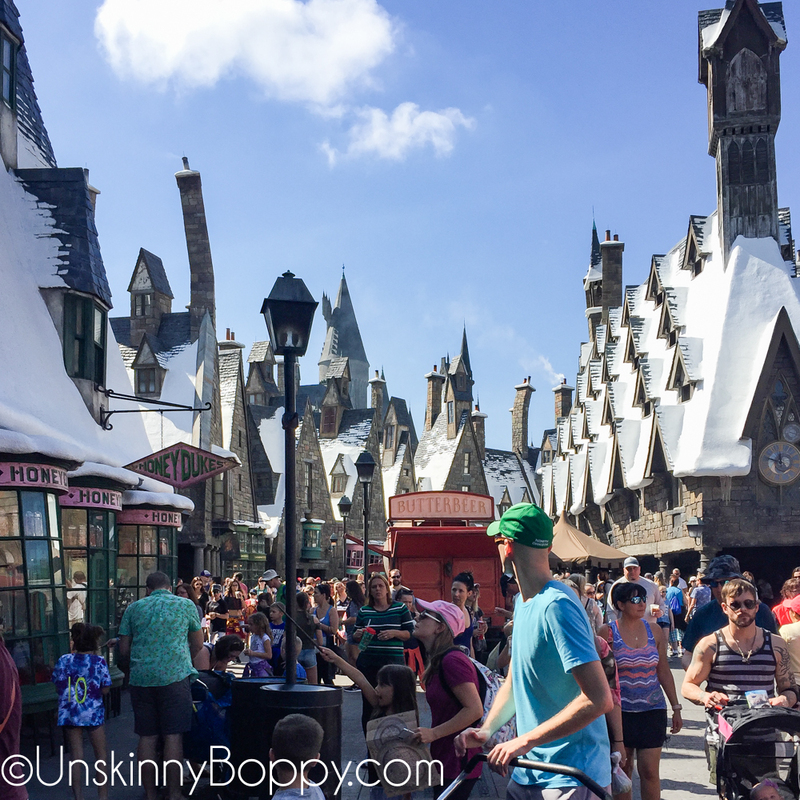 Even though it was a warm day, Hogsmeade Village is lined with snowcapped roofs which makes it feel cooler than it actually is. An ice-cold bottle of Pumpkin Juice and a Butter Beer also made the heat bearable. Butter Beer tastes a lot like super-sweet cream soda with some butterscotch flavoring. It’s not alcoholic, btw. 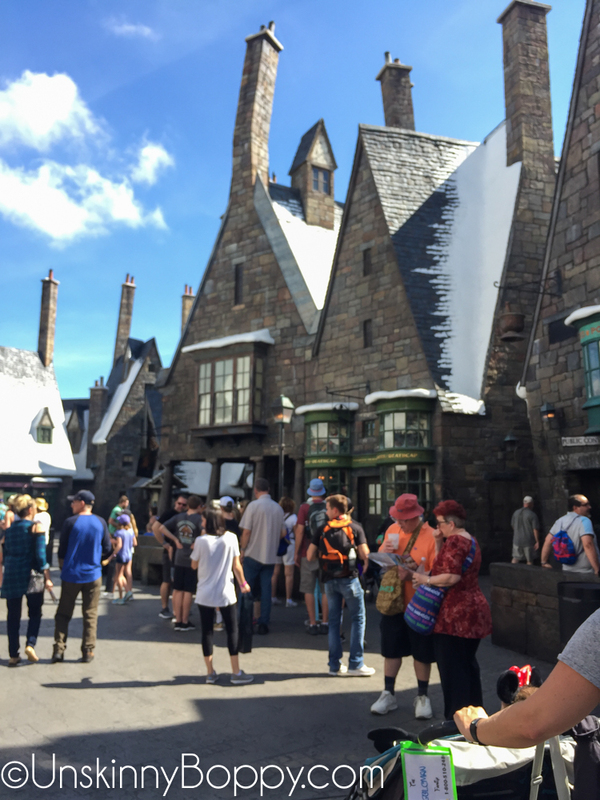 Once again, the streets were lined with the stores straight out of the fictional books, so you felt like you were a student out on a weekend excursion into Hogsmeade. I love all of the attention to detail they have put into these buildings. Check out the crooked chimney! 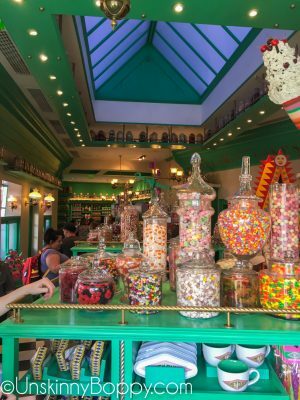 Honeydukes sold every type of candy imaginable, including chocolate frogs and Bertie Bott’s Every Flavour Beans. Garrett got a Dumbledore Wizard card inside his chocolate frog and challenged me to a game of BeanBoozled which I politely declined. No vomit flavored jellybeans for me, thanks. 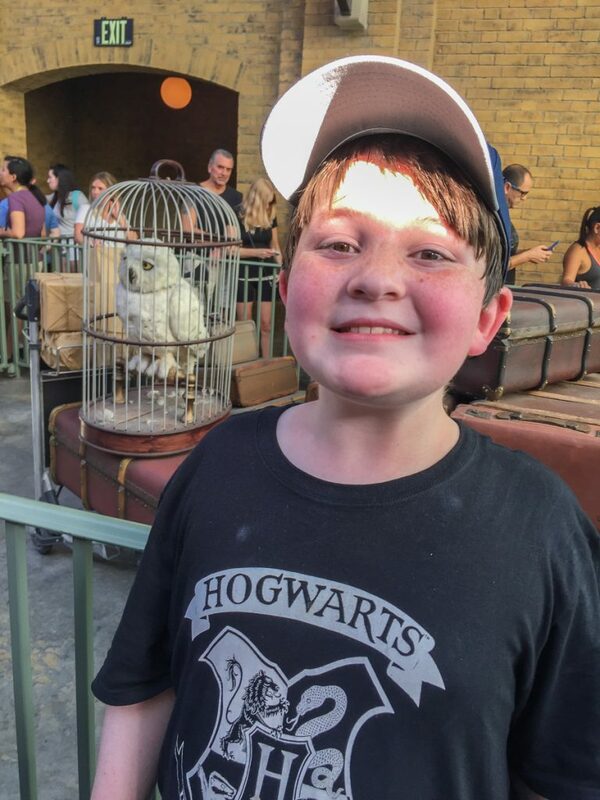 Here’s a cool tip– You can send yourself a postcard from the Owl Post and it will have a real postmark from Hogsmeade on it! But above all, the coolest thing to see was Hogwarts castle looming in the distance. It is HUGE and totally looks like the real thing. There is another rollercoaster inside the castle called Harry Potter and the Forbidden Journey. Once again, I didn’t fit inside the seats so I was not able to ride. This makes me so sad, because I truly love roller coasters and it would have been awesome to experience it with Garrett. It’s on my bucket list, for sure. They told us we could take a castle tour and not ride the ride, but we still had to wait in line to get inside and the wait time was over an hour. So…. we skipped it for this trip. Instead, we rode the Hogwarts Express back over to Diagon Alley. We intended for this to be a round-trip ride since we had already seen Diagon Alley, but once we got over to the other park we were informed that we had to get off the train and go allllll the way to the back of the line to catch a ride back. And the wait time was 105 minutes! Caroline was cranky and tired and waiting that long to get back to where we had just come from sounded like torture. There was no way we were gonna wait 105 minutes to get back onto the train that we just gotten off of, so… we cheated. I won’t go into all the details about how we did it because I’ll probably be banned from Universal for life, but let’s just say that two people can lift a stroller up and over those cattle chute rails pretty easily and Brittany the Best Babysitter is really great at sweet talking the ticket-takers. We didn’t even need an invisibility cloak. So, we made it back to Platform 9 3/4 and got to see Hedwig waiting on the train. 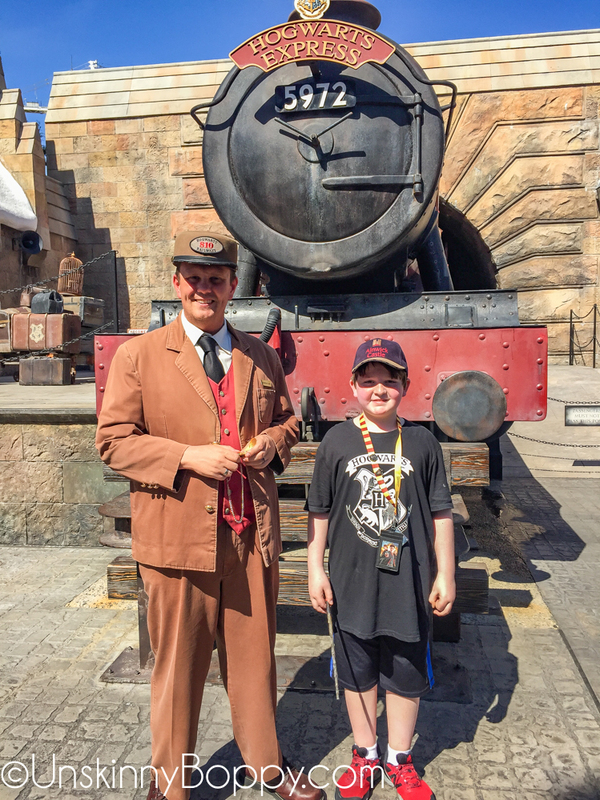 And then it was ALL ABOARD the Hogwarts Express again to head back over to Islands of Adventure. 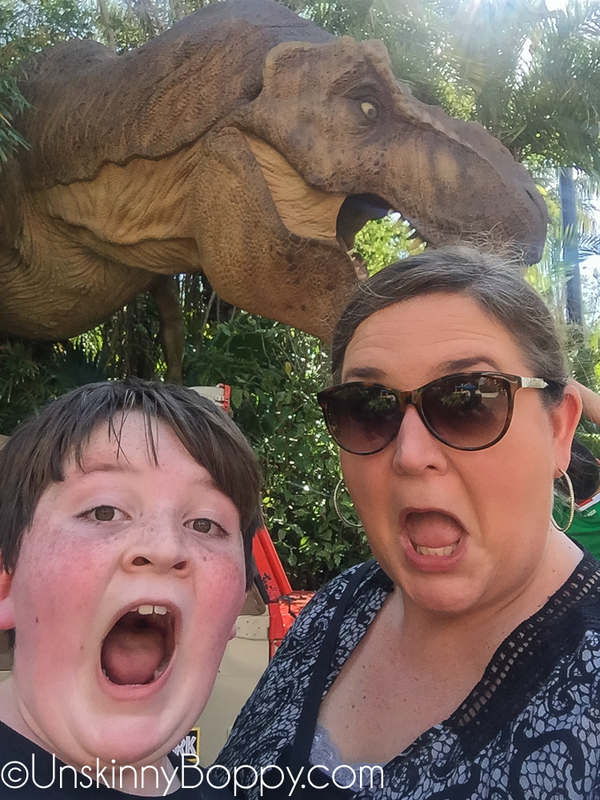 There was SO MUCH MORE to do at Universal Studios and Islands of Adventure besides Harry Potter stuff, so we took time to explore the rest of the park since Hogsmeade was so ridiculously crowded. 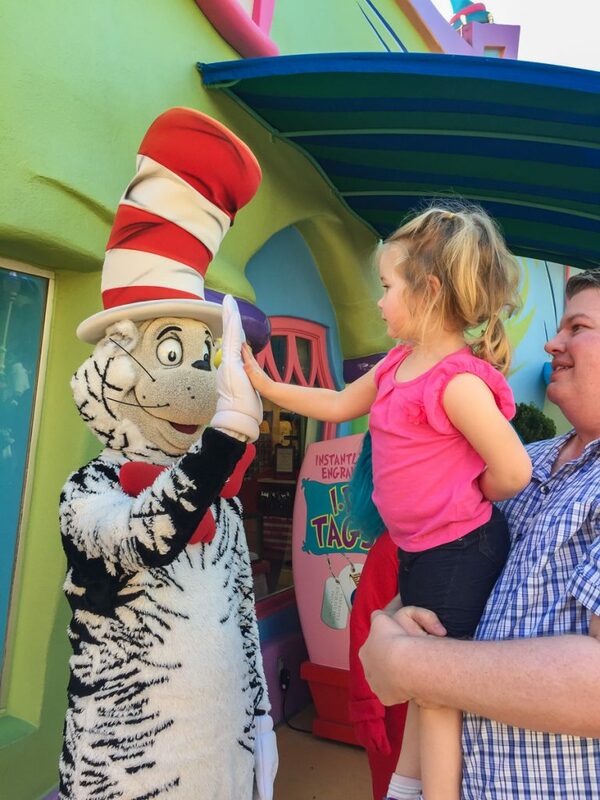 And Caroline LOVED Dr. Seuss World. All in all, this was probably the greatest birthday gift we could have ever given Garrett. It was an unforgettable trip that we all enjoyed immensely. We will definitely start planning another trip to visit soon. 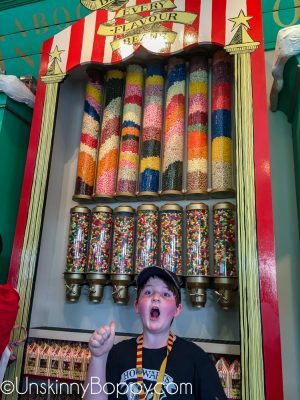 If you have a little (or big) kid who loves Harry Potter, start saving your golden Galleons now and make it a top priority to visit Universal Orlando. 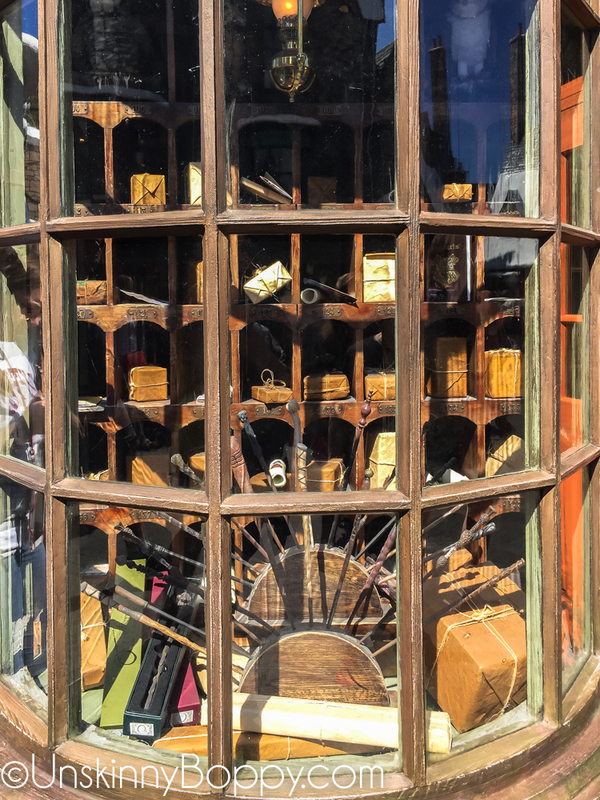 Be sure to give yourself plenty of time to explore every square inch of the Wizarding World because it is truly enchanting! 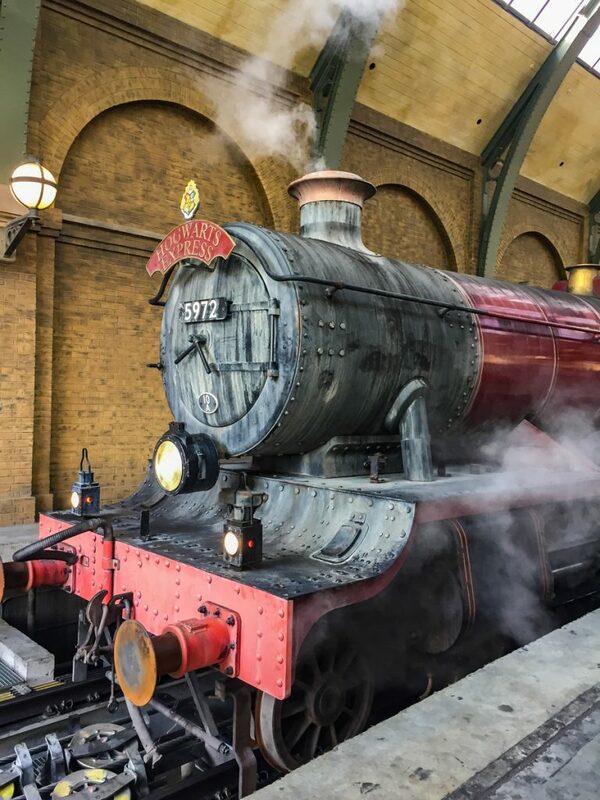 Just please don’t tell Professor Snape that we apparated to the front of the Hogwarts Express line, ok? As an avid Harry Potter fan, I am very excited about visiting here. 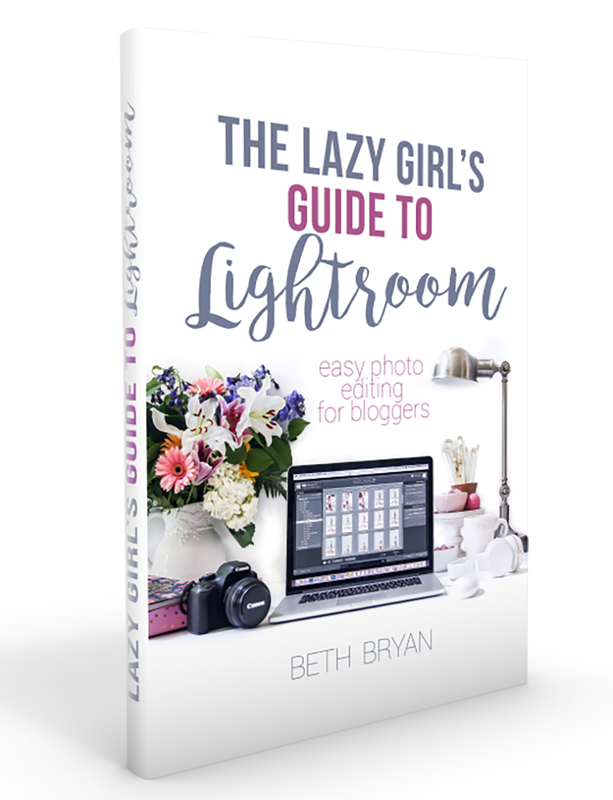 Thanks for sharing your experience dear!